Ever wonder what it would cost to run for public office? I am not thinking about running for President or member of congress I am thinking of the cost to run for the state legislature, local judge, or even dog catcher (if such an office were open). My mail box has been filled with oversized mailers telling me of the disgusting habits of the opponent and announcing that “I am more conservative than the other guy.” Some of these mailers have been poster size and always printed in brilliant colors. Each mailing must cost thousands of dollars. If only that money were spent on something useful. Oh, I don’t know, feeding the hungry, sheltering the abused, paving a highway, fixing a bridge, or educating our youth. The truly sad part of all that money spent to advise me about some man’s hanky-panky in a Kansas City strip joint or that “I am more conservative, in fact I am to the right of Attila the Hun“, makes no difference to me. I did not vote for any of those guys. In fact, I voted for people who did little or no advertising. Of course, my selections won’t win. The Missouri yahoos will no doubt select some person who is actually more to the right of Attila the Hun, which means moderates and liberals will have no voice in government. On the Missouri ballot is an amendment to the state’s constitution. This amendment is to assure that every Missourian has the right to pray in public, in state and local institutions, and at the beginning of every football game. I voted no on this amendment. You might ask, “No? Aren’t you an Episcopal priest?” Yes, I voted no and yes I am an Episcopal priest. I believe in prayer and I am an advocate and deep adherent to the Book of Common Prayer. Public prayer, however, is usually civic prayer and represents some sort of belief in a civic god. This is not God the Father, as Jesus identifies God, it is a public god that people seem to vaguely believe in. My concern with this amendment is that it one more effort by the evangelical and fundamental Christians to turn the United States into a theocracy and to establish a state religion in which liberal Christians will be dis-invited to remain citizens and everyone else will be treated as aliens. The U.S. Constitution already guarantees my right to pray, to practice my religion without state interference, and it also guarantees the rights of others to turn their backs on religion without fear of discrimination. been rejected, people do not attend worship, and church is suffering. In the U.S., a secular nation, religion flourishes the culture is rich with a variety of religious practice, and faith is widespread. This country will not continue to be the land of the free and the home of the brave if theocratic elements win and dominate our politics. After I cast my ballot, an older woman greeted me and asked how I was doing, and then pasted a “I Voted” sticker on my chest as if I had won a medal. I felt very proud. However, I wonder if she had known how I voted would that sticker gone on my chest or some other part of my anatomy. 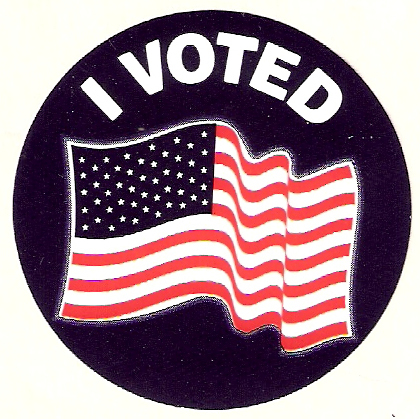 After casting my ballot, the “I Voted” tag was pasted on me like a medal. In fact, I was very proud. In Georgia we always vote against our best interest. We live in a Baptist theocracy and church is in every nook and cranny. The fresh air of freedom is stifled. I look forward to a bleak America when this current poltical contest is over. I look forward to concentration camps. I look to the end of secular speech as well as spiritual speech.